When Is Enough, Enough? Is God Leading and Directing You? This book provides spiritual guidance and healing strategies as individuals navigate through organizational challenges and roadblocks. While much time can be spent ensuring that one’s credentials are in place to equalize the playing field inside of an organization; more time should be spent with God ensuring that He is guiding every movement made in an organizational setting. 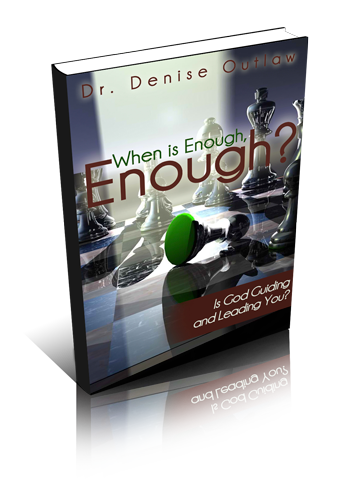 Along with spiritual and healing strategies, this book provides qualitative data on lived experiences of professionals’ successes and challenges that reinforce the need to ensure that God is the CEO and leader of all movement.